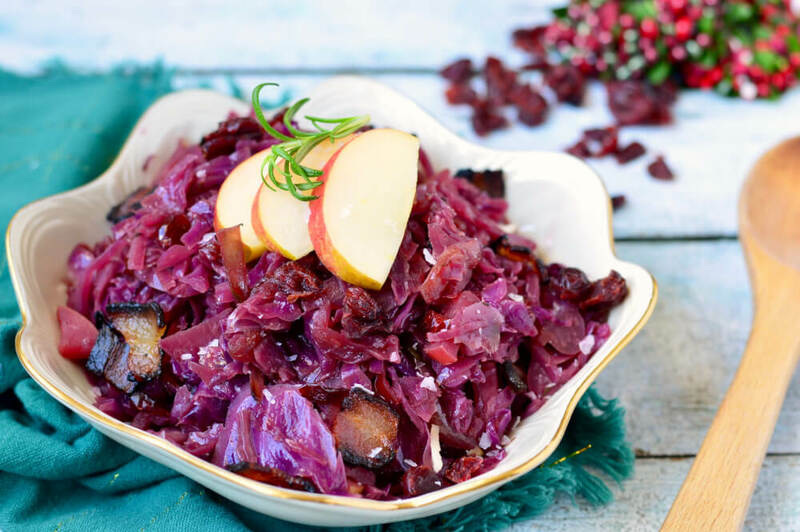 If you're getting bored having the same side dishes every night, why not change things up with this red cabbage and apple side dish recipe? It takes nearly an hour to make, including prep time, but it is well worth making because it tastes so great. It offers a well-balanced blend of sweet and sour flavours, and goes beautifully with sausage or roast meats. Try it with roast pork or even barbecued chicken breasts. Some hot, creamy mashed potatoes would finish off the dish perfectly, whichever type of meat or main course you are having. Actually this red cabbage and apple side dish tastes even better warmed up the following day, or you can have it cold as a pickle or as part of a salad. It's a versatile option which you might like to add to your regular meal rotation. 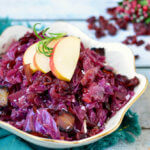 This red cabbage and apple side dish freezes well too. We are combining the red cabbage with apples, sugar, vinegar, spices and butter. Some people like to stir in a handful of raisins to add extra sweetness while others really love the tart flavour and increase the vinegar to 250ml. This is an unusual dish and it's festive too so why not make it during the holidays? Put all the ingredients in a large pan except for half the butter. Turn down the heat and cover. Give it a stir occasionally. Now you can stir in the rest of the butter and serve hot.